The peroneal tendons are important stabilizing tendons located on the outside of the ankle. 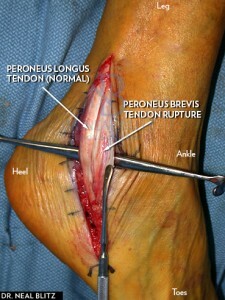 There are two peroneal tendons: peroneal longus and peroneus brevis. They both form from two distinct muscles of the outer lower leg, curve around the backside of the outer ankle (behind the fibula ankle bone), then diverge to attach to two separate areas of the foot. The peroneus brevis tendon attaches to the outer part of the midfoot, called the fifth metatarsal bone. The peroneus longus tendon however, attaches to the inner part of the foot after coursing the deep underpart of the foot. Both tendons are important to for providing ankle stability as well as daily activities such as walking, running and jumping. They are considered everter tendons of the foot and ankle, and the peroneus brevis is the main tendon performing this function. A peroneal tendon rupture is when one or both of the peroneal tendons are torn, interfering with foot and ankle function. There are two main types of tears involving the peroneal tendons. The first type of peroneal rupture is a tear directly across the tendon, where the torn tendon ends become separated resulting in complete discontinuity of the peroneal tendon resulting in loss of function of that peroneal tendon. The other type of peroneal tendon rupture is a tear that occurs within the structure that spits the tendon (or a portion of the tendon) in half the long way so that the tendon remains functional. While tears, ruptures and splits are often used interchangeably, they can be structurally different. Causes Of Peroneal Tendon Rupture? Peroneal tears are the result of an injury, whether it be an acute injury or chronic overuse of the tendons that ultimately lead to a tear. Acute peroneal injuries generally occur after inversion type ankle injuries, which occur when the foot turns inward on the ankle. The peroneal tendons can become injured in this scenario because they react by strongly contracting to counteract that inversion force, and when over-stretched or over-exerted, the tendon(s) can tear. Acute injuries can cause an immediate discontinuity of the tendon or a small tear of the tendon that can enlarge over time. Overuse of the peroneal tendon can lead to tears, especially when associated with high arched feet and/or unstable ankle ligaments that cause overexertion on the tendons. Sometimes boney prominences (example, enlarged peroneal tubercle) can irritate the tendons as they glide around the ankle, leading to chronic tears and/or splits in the tendon. What Are The Symptoms Of A Peroneal Tendon Rupture? Acute peroneal tendon injuries, are associated with specific trauma and often present with pain and swelling on the outside of the ankle. There can be pinpoint pain directly over the peroneal tendon rupture. A loss of tendon function can be detected but because there are two peroneal tendons, it can be deceiving whether or not a tendon is ruptured because the other tendon may function in its place. Acute rupture of both peroneal longus and brevis is rare. The symptoms of a chronic peroneal tendon tear/rupture can be subtle to intense. Pain on the outside of the ankle in hockey stick distribution can be present with or without activity. Pain is usually worse with activity. Swelling is common with chronic injuries. People with peroneal tendon problems tend to complain that their ankle doesn’t feel steady and “ready to give out on uneven ground”. How To Diagnose A Peroneal Tendon Rupture? Peroneal tendon problems are diagnosed with the clinical exam that the doctor will perform in addition to advanced imaging. Patients may have pain over the peroneal tendons on the outside of the foot and/or behind the outside of the ankle. Depending on the extent of the rupture, patients may have weakness when the specific muscle is tested by the foot and ankle specialist. Radiographs are useful to exclude other causes of foot and ankle problems. Some patients may fracture/injure a small bone within the peroneus longus tendon called an os peroneum, which may be detectable on xrays. Magnetic resonance imaging (MRI) is the gold standard advanced imaging study used to look for peroneal tendon pathology. Large tears with tendon discontinuity are easily seen. Tears are generally identified on MRI, however there can be false positives in the location where the the tendon curves around the bend of the ankle. Fluid around the tendon generally indicates inflammation. Fluid within the heel bone may be associated with prominent bone rubbing against the tendons. When To Seek Treatment For Peroneal Tendon Rupture? Acute foot and ankle injuries should be evaluated by a healthcare professional as soon as possible after the injury. Peroneal tendon injuries can be easily missed by doctors not familiar with the foot and ankle and further evaluation by a specialist is beneficial. Acute complete tears generally require surgery shortly after the injury. Chronic injuries with pain, swelling and weakness are indicators for treatment. The basis for peroneal tendon surgery is to repair the ruptured, torn and/or split tendon. The type of tendon repair depends on the location and extent of the rupture and whether or not there is discontinuity of the tendon. End-to-End Repair: An end-to-end rupture is repaired with strong suture. Suture is weaved on each tendon end, then the ruptured tendon ends are tied together. Tubularization: A split within the tendon, also called a longitudinal split, are more commonly seen with chronic peroneal tendon ruptures. Again, in these cases, the peroneal tendon is split down the center of that peroneal tendon effectively dividing the tendon into two (or three) portions. Small simple splits can be repaired by suturing the split together with an intratendinous stitch technique. Sometimes the split occurs off the central axis of the tendon and excising the smaller portion of the tendon may be performed. The remaining portion of the tendon is repaired and made round again by a suture technique call tubularization. Longstanding untreated peroneal splits can often lead to overall tendon degeneration, a condition called tendinosis. Here, segments of the tendon surrounding the rupture become thickened, hard and can have internal fatty deposits. Usually these areas of degeneration need to be excised and the remaining tendon repaired. Tendon Transfers: There are times when the peroneal tendon rupture and surrounding tendon degeneration makes the peroneal tendon not repairable and unsalvageable. In this case the entire diseased portion of the peroneal tendon is completely excised. In order to restore continuity to the peroneal tendon, another tendon can be transferred to replaced the function of the damaged tendon. The Peroneal Stop Procedure: When one the two peroneal tendons are deemed unsalvageable, the other peroneal tendon can be used to function for both tendons. After the damaged portions of the peroneal tendon is removed, the peroneal tendon stump ends are sutured/secured to the other functioning peroneal tendon. This peroneal stop procedure is effective because the two peroneal tendons have identical functions on the ankle joint as a stabilizer and similar functions on the foot. Additionally, the two peroneal tendons (peroneus longus and peroneus brevis) are located adjacent to each other so surgeons do not have to transfer a tendon from another area of the foot or ankle. The only caveat for this surgery is that the function of the peroneus brevis tendon must be maintained at its insertion onto the outside of the foot at the 5th metatarsal. Generally speaking, the peroneus brevis function is more important than the peroneus longus function, and efforts should be made at recovering peroneus brevis function first. Tendon Grafts: Tendon grafts are also used in peroneal rupture surgery when both tendons are deemed unsalvageable, and when the peroneal stop procedure can’t be performed. Surgeons can harvest tendon grafts from another part of the body or use allograft (tendon from a cadaver). The amount of tendon required for repair, clinical scenario, and surgeon experience. Excision of enlarged peroneal tubercle: The peroneal tubercle is normal prominent portion of the outer heel bone that acts as buttress to the peroneal tendons. In some cases this bone is prominent, enlarged and/or misshapen – causing improper wear and tear of the tendon against the bone. In some cases, this bone should be filed down to prevent further or future damage. Recovery after peroneal tendon repair surgery generally involves a period of immobilization. Small simple repairs may call for immediate walking in a removable boot whereas complex repairs may require a cast and crutches for 6 weeks. Physical therapy is commonly recommended as part of the after care. What Anesthesia Is Needed For Peroneal Tendon Rupture Surgery? Peroneal tendon rupture repair surgery often requires general anesthesia. Patients are usually placed on their side during the surgery as well.